What can modern Christians learn by paying attention to the supernatural aspects of the Bible? Michael Heiser is passionate about asking questions that challenge common views of biblical subjects. In this interview, we ask him about the reaction he’s seen while writing about the supernatural and his new book, Angels. Lexham Press: Books by biblical scholars on the supernatural aspects of the Bible are relatively rare. Why do you think these topics are often overlooked by the academy? Michael Heiser: I think there are a couple of reasons. Christians have been generally conditioned by tradition into thinking there isn’t much to angels. I went to Bible College and seminary and never had a course devoted to them. In fact, in my entire education only two class hours (including graduate school) were spent discussing angels. When the subject doesn’t matter even in biblical education it’s going to get assigned to the periphery. It’s no wonder that so few men and women who move on to academic careers in biblical studies pay any attention to the subject. More broadly, I think the supernatural is somewhat taboo, even for evangelicals. Expressing a belief in the supernatural seems un-enlightened or superstitious. We’re moderns and so we’ve moved beyond those sorts of beliefs. That may sound odd because Christians (scholars or not) are quick to affirm a belief in God, the Trinity, Jesus, and the Holy Spirit. But somehow along the way the rest of the spirit world has diminished or vanished in our belief system. We’ve somehow convinced ourselves that affirmation of the core elements of Christian thought are respectable (or ought to be) in the wider intellectual world, but belief in the supernatural is a bridge too far. That’s self-delusion. The fact is that nothing we believe as Christians about the Triune God and the doctrines that extend from that foundational point of theology conforms to the Enlightenment or a modern scientific worldview. We don’t gain intellectual capital by affirming parts of what the biblical writers believed about the supernatural world and discarding things that make us uncomfortable. Christian pastors and thinkers go to great lengths on one hand to defend things like the deity of Christ and the resurrection and then to explain away parts of the Bible’s supernatural outlook they deem too weird. It’s terribly inconsistent and, truth be told, undermines biblical authority on the spiritual world. 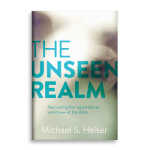 LP: Before we talk about Angels, your book The Unseen Realm has been a bestseller since it was published three years ago. What has been the reaction to the book from the scholarly community as well as lay readers? Is there anything in particular that has surprised you? MH: The lay reader response has been overwhelming. The book has maintained a nearly 5-star rating on Amazon through over 800 reviews. That’s unheard of for a book with footnotes! On the academic side, the book has been positively reviewed in several places that matter in the world of academic biblical studies. I know of several professors who use it in classes. I’m not surprised on either front. My podcast (the Naked Bible Podcast) gets 100,000 downloads a month. We don’t do supernatural topics most episodes, but these numbers show that there are a lot of people in churches across the country—the world even—who want serious content and aren’t getting it where they worship. The book intentionally transcends denominational preferences as does the podcast. It’s the “naked” Bible because the text of Scripture unfiltered by denominational preferences and Christian in-fighting takes precedence. It’s the same with The Unseen Realm and now Angels. I want to convince people that they need to read Scripture in light of the context of the original writers and readers. That approach is revolutionary to a lot of folks. Academics understand that out of the gate, so the approach of the book isn’t new to them. I tell fellow scholars that I aim to present the fruits of their labors to the lay community. I want them to know their work is useful for the average person who cares about the Bible. I believe there’s an appetite for that sort of content and my role is making it decipherable to people who don’t have degrees in biblical studies. Scholars who are patient enough to think about what I’m doing appreciate it. They should, because a lot of people want to learn from them. LP: Why is it important for Christians to have a biblically accurate understanding of angels today? Are there some practical implications that flow out of that? MH: The world of the heavenly host—specifically defined in this book as those supernatural beings who remain loyal to God—is a template for how God relates to humanity and governs the world of humankind. The heavenly host frames how the Bible talks about our status as children of God, imaging God, and partnering with God to accomplish his plan to redeem the world. The Unseen Realm lays out that case. 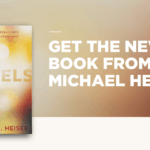 Angels: What the Bible Really Says About God’s Heavenly Host is a book that drills into God’s agents, providing more detail than those other works. LP: Along with Old and New Testament teachings about angels, you also look at Second Temple literature. How does this literature help us better understand the canonical teachings about angels? MH: Second Temple Jewish literature shows us how people who took the Old Testament with the utmost seriousness read and understood it. Some of it also preserves certain contexts for the Old Testament that are not obvious to us. The New Testament writers were quite familiar with these writings. They quoted or alluded to them frequently. The issue for us isn’t whether those other books should be thought of as sacred Scripture. Rather, when we read books that biblical writers read, our chances of comprehending what they wanted to communicate to their audience increases. Like ancient Near Eastern literature is crucial for contextualizing the Old Testament, Second Temple Period literature is an essential part of knowing what New Testament writers wanted to say and how they re-purpose their Bible, the Old Testament, to communicate. It comes down to whether we want to read our Bible more intelligently, more discerningly, or not. We need to stop pretending the right context for interpreting the Bible is our own context, or our denomination’s creedal history. All of that comes centuries or millennia after the books of the Bible were written. If we want to know what biblical writers really thought about the heavenly host, we need to let them tell us. Hearing their message requires reading their thoughts in light of their own intellectual and historical context—not the ones we grew up with. LP: The final section of Angels deals with common Christian myths about angels. Can you give an example of a cherished myth that Christians should abandon? MH: One of my favorites is the idea that one-third of the angels rebelled with Satan before the creation of Adam and Eve. There isn’t a single verse in the Bible that says that. In fact, the only place where the language of “one third” accompanies a description of angels is Revelation 12—whose content is associated with the birth of the messiah and the subsequent persecution of believers. The war in heaven is a battle between good and evil to conquer the messiah and his people. It is clearly not set in the primeval past. And yet the idea has been passed on as doctrine. LP: Are there any other writing projects you have in the works that you can tell us about? MH: I recently submitted the manuscript for the companion book to Angels. That one will be called Demons: What the Bible Really Says About the Powers of Darkness. I present the biblical theology of Satan and evil spirits in a way that I’ve not seen before. I think my presentation will make the bewildering subject of evil spirits more comprehensible. As with The Unseen Realm and Angels, I’m relying on peer-reviewed scholarship on the biblical text and the context of the original writers. Great Deal Alert: Get I Dare You Not to Bore Me with the Bible for Just $0.99! Forget the Halos. Ditch the Harps. The New Book from Michael Heiser Has Arrived.